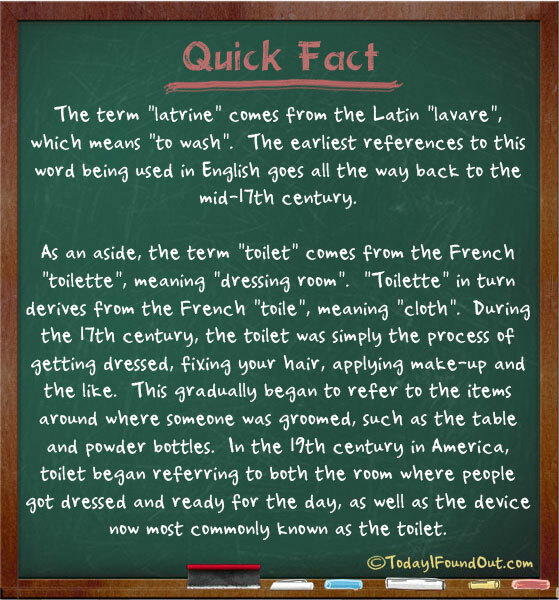 The term “latrine” comes from the Latin “lavare”, which means “to wash”. The earliest references to this word being used in English goes all the way back to the mid-17th century. As an aside, the term “toilet” comes from the French “toilette”, meaning “dressing room”. “Toilette” in turn derives from the French “toile”, meaning “cloth”. During the 17th century, the toilet was simply the process of getting dressed, fixing your hair, applying make-up and the like. This gradually began to refer to the items around where someone was groomed, such as the table and powder bottles. In the 19th century in America, this term began referring to both the room where people got dressed and ready for the day, as well as the device now most commonly known as the toilet.